Sometimes confused with replacing the lock, rekeying is a less expensive method for recoding an existing lock. Rekeying involves the disassembly and recoding of your current lock and the creation of a new key, so that all previous keys no longer work. Rekeying is good idea when first moving in to your home or office, or periodically to deactivate lost or loaned keys. Many times we are able to rekey all locks in a home or business to one new key. Especially with older lock systems, it’s often the case that a repair can save the cost of a complete replacement while maintaining the style of the original door and hardware. 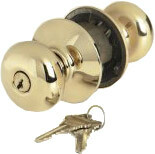 Custom work as necessary can sometimes extend the life of an older lock. When it’s time to replace a lock or add additional locks, Bill’s Lock & Key can assist in selection of new hardware that satisfies the style, budget and security requirements of your application. Especially for landlords and property managers who oversee multiple units in a single building, the master key plan provides one key to open all units of the building.